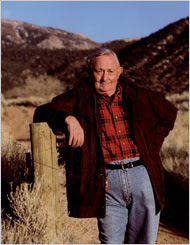 Tony Hillerman, 83, died yesterday. A journalist turned fiction writer, Tony Hillerman wrote mystery novels featuring Joe Leaphorn and Jim Chee, Navajo policemen, who never lost their sense of place or the vital drive for intellectual and spiritual sustenance that builds a sustainable culture. He took a genre much beset with hackery and feebleness of mind and literary sensibility and gave it a place among the finest works of American literature. I keep prowling the bookstores looking for a new Hillerman book. That prowling is at an end, but the regard for a true and respectful voice will never die. I received my baccalaureate degree from Augustana in Rock Island, Ill., and I still think back on the convocations and the discussions they inspired among students in the Union. I get e-mails from the college and am happy that the tradition of involving the campus in examinations and analysis of what is going on about us still takes place somewhere. I am reproducing one of the recent press releases which provides as good a critique of journalism and current sources of information as any I have read of late. Rock Island, Ill. Oct. 15. Americans should demand more nuts-and-bolts journalism and less "American Idol" reporting from the national media, said veteran journalist Bob Levey, speaker at Thursday's Community Convocation Series at Augustana College. Levey, a reporter, broadcaster and former Washington Post columnist, used the theme "Campaign Coverage 2008: Not the Media's Finest Hour." Pointing out that "it's almost over," he said reporters and editors soon will be looking back at how the campaign was covered. And what they see won't look good. "We're going in an unhappy direction," he said. Among the flaws he said editors should see in the coverage is "prognostication journalism," such as the October 2006 reporting that told the public Hillary Clinton and Rudy Giuliani were shoo-ins for their party nominations. He said the trend toward personality journalism in the campaign coverage starting two years ago was the "first crack in the wall" of traditional reporting. Even serious media outlets have been infected by what he called "television values." Looking back, he said reporters were not reporting candidates' plans and stands on the issues. Instead, they focused on topics such as Hillary Clinton's wardrobe, John Edwards' wife and her illness, and Giuliani's family problems and temper. "Did you get the kind of coverage you deserved?" he asked the Augustana audience, adding that editors and producers think the audience won't care if the coverage is not delivered via gossip and personality. Levey also decried the tendency of broadcasters to use talk show hosts -- whose political opinions are well-known -- as reporters, and not to let audiences know about potential conflicts of interest, such as allowing NBC's Andrea Mitchell, wife of former Federal Reserve chairman Alan Greenspan, to report on economic affairs. "The wall between straight reporting and opinion has begun to crumble," Levey said. News values are being lost in the struggle for market share, he added. Levey also discussed the tensions produced by the pressure on media outlets to "get it out there" as fast as possible, and the difficulties reporters face in getting direct access to candidates. "The worst thing to happen in the 2008 campaign is Sarah Palin's refusal to meet the press," he said. For serious and thorough journalism to be revived, readers and viewers must get involved. "It needs a push back from you and it needs a push forward from us," Levey urged. "You have to demand it… and we have to find a way." Getting information from the Internet may be one route, he said, citing politico.com as an example of a good news source. However, that outlet, like many others, falls into "horse race coverage," he added. Another possibility, Levey said in answer to an audience question, is that philanthropic journalism could save the serious coverage, such as foreign reporting and investigation, that is increasingly threatened by the downtown in profit at large newspapers, . This could only work as long as the donors stayed in the background, he added, and did not dictate what would be covered. evey was been on campus for several days, speaking to faculty and students and visiting classes. "You've got a wonderful school here," he told his audience. Levey's column, "Bob Levey's Washington" appeared five days a week in The Washington Post From 1981-2004. During his 36-year career at the Post, Levey covered presidential politics, Congress, local news, features, and sports. His column won major awards from the Society of Professional Journalists and the Washington Journalism Review. He was named one of the top columnists in Washington by Washingtonian Magazine six times, and in 1999 the magazine named him "Washingtonian of the Year." He also has had an extensive career in electronic media and has worked for seven radio stations, four TV stations, and one Internet site. "Levey Live," an hour-long chat that appeared twice each week on the Post's website, won consistently high ratings. He recently was appointed to the Hardin Chair of Excellence in Managerial Journalism at the University of Memphis, where he will teach courses in the newspaper/magazine concentration. In a tradition of journalism almost forgotten until this year, The New York Times assigned 12 of its staff members to check the accuracy of facts cited during the last debate. The Times joins fact-checking organizations which have monitored campaign statements during the year. See its analysis of last night's debate here. John McCain was called an ace by some of his Navy peers. For some, it was a matter of sarcasm. He was at the controls of five aircraft that crashed or were damaged, including the fighter he was flying when shot down over Hanoi. Two of the incidents were not under his control. The first was when he was sitting in his aircraft on a carrier deck waiting to take off. A missile from another fighter somehow was launched and hit McCain's aircraft. He exited the craft and was not injured. The second was when he was hit by a missile over Hanoi and his craft's wing was shot off. He recalls in his autobiography that his instruments indicated a missile had locked onto his aircraft and he probably should have taken evasive action. But he was a know risk-taker and kept on course for the target he was assigned to hit. When his craft was struck, he ejected and landed in a lake and broke a leg. He was taken prisoner and was a POW for 5 1/2 years. Americans respect and honor his service to his country and the years of torture and confinement he experienced. As one who approved of America's invasion of South Viet Nam initially, I am among those who grew dismayed and disappointed in the U.S. when it became apparent what deceptions and contrivances got us into that war, and more as the killing and ruining of the Vietnamese people mounted. However, as a veteran, I still respected and honored our troops, many of whom were draftees, because, for the most part, they did what they were ordered even at the cost of 50,000 American lives. As the fragging incidents in Viet Nam among the American troops took on the aspect of mutiny, I also understood. People lost respect for commanders who issued gratuitous orders for troops to go into battle of dubious merit and unplanned result. All the troops who served in Viet Nam were heroes, and John McCain was certainly included. Gen. Wesley Clark was soundly castigated when, after acknowledging McCains service and record, he stated that McCain "hasn't held executive responsibility. … I don't think riding in a fighter plane and getting shot down is a qualification to be president." Slate magazine suggested Clark's remarks were a matter of the resentments that grunts--infantry riflemen--felt toward flyboys. Clark was wounded while commanding an infantry company in Viet Nam. There is much more to the skepticism regarding flyboys as leaders and commanders. As many of McCain's peers and commanders pointed out, he was a risk-taker, often wildly heedless. The three airplanes he crashed or damaged in non-combat situations demonstrate that point. In 1960, McCain crash a plane into Corpus Christi Bay. The investigation into the crash said the plane crash was pilot error. McCain was flying with too little power to sustain flight for the maneuver he was making. In 1961, McCain managed to bring a damaged aircraft in, but he left a good portion of Spain without power. He was "hot-dogging" over Spain in low maneuvers when he flew into some electrical transmission cables. The report said he landed with ten feet of cables dangling from his plane. By his own admission, it was a heedless moment. In 1965, he used a Navy jet to fly to a Navy football game. As he returned, he said he heard an explosion and the craft lost power. McCain ejected. However, the investigators found no evidence in the wreckage to support the contention of an explosion or a loss of power. As it does with Gen. Clark, McCain's history of sitting in planes and enduring 5 1/2 years in the Hanoi Hilton comprise honorable service, but hardly demonstrate leaderships. One can only wonder what he would do with the tiller if he were to steer the ship of state. The McCain-Palin announcement that they are "taking the gloves off" in going after Barack Obama's character has resulted in more investigations into John McCain's past associations and activities. In the latest, MSNBC is running this story about McCain's connection with a group involved in the Iran-Contra business in the 1980s. WASHINGTON - GOP presidential nominee John McCain has past connections to a private group that supplied aid to guerrillas seeking to overthrow the leftist government of Nicaragua in the Iran-Contra affair. McCain's ties are facing renewed scrutiny after his campaign criticized Barack Obama for his link to a former radical who engaged in violent acts 40 years ago. The 21st century has brought a deterioration of the English language in America. It has ushered in an Age of Illiteracy. Anyone who uses language well or reveres such usage is an elitist--that most despicable of creatures. At one time elitist referred to a person who subscribed to the fascist-based notion that the world was divided into a superior class and a whole bunch of inferior classes, and it was an inalienable right of the superior class to rule over and determine the fate of the inferiors. In that context, the term had a huge ironic dimension in that most people who placed themselves in the elite class had little substantive reason for doing so. It conveyed that idea that some omega dogs were assuming the role of alpha dogs. The deterioration of language is largely due to the deep, festering resentments people have toward those who possess natural attributes of talent or grace. No one is an object of such resentments more than Barack Obama. Here is a man who is half African American, comes from a broken home, was raised by a single parent. But he is the embodiment of the American principle. He earned his way to and through Columbia Univeersity, then Harvard School of Law, and edited the law review. His success at rising from a broken family to a prestigious performance on the national stage is termed elitist. There are, of course, racial resentments that intensify his offense. But the worst thing he is charged with is using language well. The current issue of The New Yorker endorses Obama for president. It also confronts the deterioration and devolution of language that is apparent in our political life. The Republican party seems to have adopted a contempt for the competent use of language as a basic value of its political philosphy. Doesn’t this reflect a deep suspicion of language itself? It’s as if Republican practitioners saw words the way Captain Ahab saw “all visible objects”—as “pasteboard masks,” concealing acts and deeds and things—and, like Ahab, were bent on striking through those masks. The Melvillean atmosphere may not be accidental, since, beyond the familiar American anti-intellectualism—to work with words is not to work at all—there’s a residual Puritanism. The letter killeth, as St. Paul has it, but the spirit giveth life. (In that first debate, McCain twice charged his opponent with the misdeed of “parsing words.”) In this vision, there is something Pharisaical about words. They confuse, they corrupt; they get in the way of Jesus. Geroge W. Bush and Sarah Palin represent atitudes in the American psyche. The proficient use of language is suspect. It is offensive to many. The blogosphere, that region of "citizen journalism," illlustrates the attitude with abandon and abundance. Something that goes far deeper than politics is at work. Mere equality never was an acceptable eidea to some of those omega dogs. The deterioration of language is a prime symptom of something that is happening to democracy. When the McCain-Palin campaign decided (see the previous NVB post) to go after Barack Obama's character with the contention that his crossing paths with William Ayers makes him somehow a suspect in acts of American terrorism, it set up Sarah (the Bull Pit) Palin to go out and stir the pit. Over the weekend, the media began publishing stories of its probes into John McCain's personal history and what it reveals about his character. It did not take much to find military officers who served with McCain and who cast shadows on McCain's self-promotional images of himself. A Washington Post story takes a detailed look at McCain's first marriage to Carol Shepp McCain. According to the account, the marriage survived his five-and-a-half years as a prisoner of war and an automobile accident that left Carol severely injured, but not McCain's ambitions and predilections for screwing around. A Los Angeles Times story details McCain's career as a naval aviator. The military sources quoted state that anyone else would have been grounded, but being the admiral's son kept him flying. He crashed two airplanes he was flying. The Rolling Stone takes an intensive look at both McCain's military career and his behavior as a prisoner of war. He earned the disdain of some of his fellow POWs. Advisory for air travelers: the crap-flak is filling the air and flying might be dangerous. The McCain-Palin campaign has announced that because it can get nowhere on the issues, it will spend the rest of the campaign assassinating Obama's character. In 1984, one of the characters is a founder of "the party," Emmanuel Goldstein. As the party grew obsessed with totalitarian power, it branded Goldstein and his fellow founders as "enemies of the people" because their original political principles opposed totalitarian rule. Goldstein had written a book which contained implicit criticisms of the betrayal of those original principles and their displacement with mind-numbing slogans and lies. 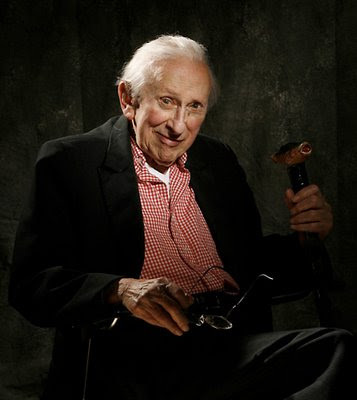 During Hate Week, Goldstein's picture was flashed on the television screens as the image for vilification and of the danger he posed to the totalitarian and repressive new world order. The McCain campaign plans to turn Obama into its Goldstein. Brain-washed bloggers have been doing ministry-of-truth type denials and manufacturing of facts since Obama entered the presidential picture. They are determined to portray him as a smooth talking black dude who down deep is harboring racial and political resentments he plans to unleash on whitey should he obtain the power of the presidency. They tried to use the Obama family's membership in the church of the Rev. Jeremiah Wright as evidence of a racial radicalism fueled by "liberation theology." When Wright said goddamn America for its history of slavery and racial discrimination and oppression, he was cited by the regressive goon squads as anti-patriotic and a threat. Obama, they surmised, must have sat in church and heard this view. That makes him an enemy of America. According to the Republican Party line, when the Tuskegee Experiment is mentioned, we are to jump to our feet and sing a rousing chorus of "God Bless America." No evidence can be found that Barack Obama took such action, so he is an enemy of the state, according to the mindset that guides the McCain-Palin campaign. One of the facts that the McCain-Palin Maligning and Brain-Washing Cell are trying to use to prove Obama's radica, anti-American agenda is his service on the Chicago Annenberg Project, which was in charge of distributing $50 million of grant money on projects to improve education in Chicago. A person who advised the project directors was Bill Ayers, a founder of the anit-Vietnam War organization, the Weather Underground. The organization planted bombs in protest to the war. Ayers and his wife, Bernardine Dohrn were leaders of the organization. Ayers is now a professor of education at the University of Illinois, Chicago Campus. He has written 40 books on education. He was utilized in this capacity by the Chicago Annenberg Project Board of Directors. He also happens to be a Hyde Park neighbor of the Obamas and has supported Obama's political campaigns. The McCain-Palin campaign is trying to inflate this into evidence that Obama is plotting a radical racial agenda for America. The New York Times, that medium of racial radicalism, has a comprehensive story on this episode in Obama's career. McCain-Palin campaign is running television ads of the Emmanuel Goldstein kind showing images of Obama and Ayers as co-conspiring enemies of the state. Let us now remember slavery, racial oppression, lynchings, the massacre at Wounded Knee, and the 4,100 dead soldiers in Iraq, and rise to our feet as the McCain-Palin campaign begins its Hate Month, and let us shatter the eardrums of the world with our chorus of "God Bless America. " Cable news media think that all Americans are suffering from terminal media mind. When it comes to talk of who has brains, cable news makes a constant self-admission that it doesn't. In all the talk over who "won" the vice-presidential debate, the cable news yammer squad has posited that Sarah Palin wins if she just does not screw up. So, the standard is that one wins a debate if one does not implode. The wisdom is that if Palin does not screw up, she redeems her shambling and bluff performance on the recent TV interviews that have provided the hilarious moments in the election campaign. The commentators assume that a creditable debate performace will erase the memory of those revelations of an absence of knowledge. Sarah Palin showed that she was trainable and could retrieve talking points from the campaign crib book on command. That just proves that she can do what she is told. It does not change the fact that she is a campaign gimmick who is far out of her depth. And while the TV commentators lauded her for her folksy speech, many people who have some education and respect true knowledge and reason find smarmy references to Joe Sixpack and soccer moms an insult to the intelligence. While we might enjoy coffee with them occasionally, we don't want them at the world negotiating tables or shaping the policies of our country. But the big factor that the media minds can't grasp is that the nature of campaigns tells us more about the qualities of candidates than their momentary performances. Hillary Clinton at one point in her campaign decided "to go Republican." Her campaign took to maligning Obama. And many influential people--Sen. Ted Kennedy, Bill Richardson, and on and on--withdrew their support and gave it to Barack Obama. When individuals adopt character assassination as a campaign tactic, they brand themselves as power hungry to the point of being dishonest and malicious. This happened to John McCain. After the Republican National Convention, he launched ads and made stump speeches that ranged from mean-trivial to out-and-out lies. Performance in a debate cannot erase the memory of someone who betrays the trust in his revelations of a malicious streak that calls his honesty into question. Smarmy speech and attempts to "identify" with the ordinary folks are not the qualities we look for or need in the White House. Smarmy does not work for anyone. Last Friday, at the Brown County Democrat's $, 1-A-Month-Club, Aberdeen Mayor Mike Levsen and City Attorney Adam Altman spoke against Initiated Measure 10, pointing out the many flaws. Actually, the measure grew out of a scientific experiment gone awry. The theory was that if you put an infinite number of Sarah Palins into infinity with an infinite number of keyboards, you would come up with manuscripts of every literary classic ever written. The experimenters could not come up with an infinite number of keyboards and not many Sarah Palins. The result was Initiated Measure 10 and its bluff and gibberish. Our sights are set on something more that is needed. The South Dakota legal code is not that much more clear on open records than Initiated Measure 10. The party that has dominated the State House for so many years dribbles down its collective pants leg at the mention of truly open government. It had a chance last legislative session to improve open government laws, but the bill introduced by Sen. Nancy Turbak Berry had the effect on the dominant party of a diuretic overdose. What South Dakota needs is laws that open all public records, with the exception of those covering proceedings that require confidentiality up to a point, such as law enforcement investigations and contract negotiations, and certain aspects of personnel records. Those latter instances need to be covered by a sunshine law which opens the proceedings up to full disclosure after a reasonable period of time, and then it needs a Freedom of Information Act to spell out the procedures through which records can be obtained and to guarantee that ALL citizens have access to them. Such acts may be borrowed from other states, such as Illinois. And if they are borrowed, no one will accuse the drafters of plagiarism. They might be convicted on charges of democracy, however. U.S. GOVERNMENT BAILOUT OF KAK JEWS BY KAK JEWS! - THE TRUTH! Point, the First: THERE IS AN ABSOLUTE CURE FOR ALL THIS KAK JEW SOCIALIST ABOMINATION: VOTE EVERY SOCIALIST INCUMBENT OUT OF OFFICE! Once you see their long-term scam agenda (below), throwing out the SOCIALIST BASTARDS won't take much effort. "The Federal Reserve bails out AIG under the disguise of 'government'." The FACT is: The Federal Reserve IS NOT A GOVERNMENT AGENCY! Period. All the grand-sounding lies and details are rampant with any newscast, local and national, so they do not require repeating here. The simple fact is that KAK JEW-Controlled government 'agencies' have concocted a financial bailout SCAM to financially protect corporate KAK JEWS to the tune of $700/$800 BILLION DOLLARS charged to and taxed back upon the common U.S. Citizen whether currently employed or not. Wall Street charged/billed to Main Street, Suburban Street, County Road and Rural Route without any permission or thought of consideration for the GENERATIONS who will make these payments to the high-living GENERATIONS of the current crop of KAK JEWS! Quoting U.S. House Representative Ron Paul (R) U.S. District 14, Texas: "Abolishing the Federal Reserve will allow Congress to reassert its constitutional authority over monetary policy. The United States Constitution grants to Congress the authority to coin money and regulate the value of the currency. The Constitution does not give Congress the authority to delegate control over monetary policy to a central bank. Furthermore, the Constitution certainly does not empower the federal government to erode the American standard of living via an inflationary monetary policy." You'll note Representative Ron Paul called the scenario but DOES NOT MENTION any "WHO" is actually responsible! "WHO" then on to final votes: check the "WHO" at each point in the game and see how many KAK JEWS were involved and those same KAK JEW-Connections. Representative Ron Paul CANNOT tell you, if he wants to live; Wolf Blitzer, Tom Brokaw, Charles Gibson and Katie Couric WON'T tell you if they want to KEEP their KAK JEW-Controlled jobs! Nevertheless, KAK JEW SOCIALISTS and their puppets in government ignore both the Constitution, the 'government' and We, The People, and arbitrarily issue about HALF A TRILLION U.S. DOLLARS - almost twice the U.S. cost of World War II when everything had to be rationed to afford it - to bail out the KAK JEW-DOMINATED 'financial' organizations: Bear Stearns, now American International Group (AIG), don't count Lehman Brothers out of the game yet; and the ultimate utopian KAK JEW grab-the-money-with-no-liability: Fannie Mae and Freddie Mac, instituted under the Marxist Reign of Bill Clinton and effected into 'law' by the Republican SOCIALIST-CONTROLLED Congress. And it isn't over yet! KAK JEWS? Yep. Don't think so? The take the time to CHECK the "who" is, was, and will be, on top of this whole lying, thieving scenario of each and every 'institution' and 'government' AGENCY involved and tell the world if that is a grand collection of KAK JEWS or the City Council of Beijing! Roy Archibald Young: 1927-1930 - Master of the 1929 Stock Market Crash! Ben Shalom Bernanke: 2006 to Date. KAK JEW or KAK JEW PUPPET, take your choice. All were/are One World Government SOCIALISTS stinking of Rockefeller-Rothchild. FYI: Now you know why The Fed doesn't account to congress: IT DICTATES TO CONGRESS! The Fed came up with this last bailout without even so much as a howdy-do to Congress or anybody else. Nothing new there, if anybody in Congress doesn't play along, they get BOYCOTTED by all the other KAK JEWS with an interest in the circle explained immediately below. We call it the KAK JEW to KAK JEW to KAK JEW circle of circumstance, probably better called "CIRCLE OF POWER" … as that is exactly what it is: above the law collusions and conspiracy totally immune POWER! KAK JEWS stealing everything in sight - with only KAK JEWS for anyone to complain to - KAK JEWS in all the enforcement and regulatory 'agencies' - covered by more KAK JEWS in all the relevant courts - knowing other KAK JEWS are going to glorify them in every medium and way available. And WHERE did all the reputed 'private sector' money come from? What 'money' there actually was come from KAK JEWS at institutions like AIG, money market funds, "YOUR" money being 'managed' via 'investments' in other KAK JEW financial scams that will now be LOST to YOU and reimbursed to the KAK JEWS, et cetera: All KAK JEW-controlled. The rest of the 'money' came from 'government' KAK JEWS running the credit computers at The Fed, creating the appearance of financial stability whether the money ever got printed or not. Somebody CREATED this mess, and if "YOU" didn't, and "I" didn't, then whoever was IN CHARGE has to be guilty. But they couldn't have done it alone, there's just too many laws, regulations, directives, executive orders, Gestapo 'enforcements' to prepare, court precedents and 'interpretations' to get enacted - requiring massive collusions and conspiracies. Well now, and WHO is in positions necessary to accomplish all that? THE KAK JEW-CONTROLLED UNITED STATES CONGRESS! And WHO is behind all the necessary publicity? THE KAK JEW-CONTROLLED MAJOR MEDIA: NEWSPAPERS, RADIO, TELEVISION AND ENTERTAINMENT, MAGAZINES AND ALL! Write your local newspapers, radio and television stations and tell them in no uncertain terms - vulgarity and racism if you see it (they still have to read the contents) - that "YOU" are fed up with their SOCIALIST agenda and glorification of MORAL DEGENERACY! Then write (a postcard is best because everyone who sees it will have read at least some of it) every ADVERTISER and tell them "YOU" will not tolerate their SUPPORT of the media's SOCIALIST agenda and glorification of MORAL DEGENERACY! Those communications will get attention! Give it about a week, ten days at the most, and you'll see ADVERTISEMENTS about 'fairness' and 'honesty' and 'trust' from all that media. They'll be LYING though their damned teeth and their only intent is to SEE IF YOU HAVE ANY … TEETH! And THAT is your invitation to LET THE SOCIALIST BASTARDS HAVE IT AGAIN! CANCEL any subscriptions, and send your notice of cancellation to the HIGHEST ranking name you can find in their materials. Send a copy of your CANCELLATION to each and every advertiser! Advertiser? Yep. Advertising is sold/priced/valued on the NUMBER of people it reaches (called "impressions" for each and every documentable exposure even to the same person) and the advertiser instantly KNOWS that (1) "YOU" aren't kidding, and (2) DOESN'T KNOW how many more there are like you that won't/can't take the time to tell anybody! Those are NUMBERS neither the media nor the advertiser can ignore! And both damned well KNOW that one for a fact from first-hand experience. RESTORE THE CONSTITUTION - ALL OF IT - OR ELSE! END THE KAK JEW SOCIALISMS IN GOVERNMENT! END THE KAK JEW CONTROLS OVER GOVERNMENT! STOP FEDERAL GOVERNMENT BLACKMAIL (Federal 'standards' or loss of revenue until 'compliance')! STOP THE DAMNED LIES AND GOVERNMENT COVER-UPS! Enough letters to the Editors, newspapers, radio and television, will get "YOUR" points across, and especially if you REFUSE to sit down, REFUSE to shut up, and REFUSE to stop talking to anybody and everybody else who is as angry as you are. GET POLITICALLY ACTIVE! Being stupid enough to NOT VOTE - regardless of your lame-brained excuse - is the exact game the KAK JEW SOCIALISTS want you to play. Unless you vote, and you can't vote if you don't register, and you must register in time: they don't have to humor you or give a damn whether you like what is happening to you or not - in spite of all their grinning 'pretense' of concern. REGISTER TO VOTE - LET THE BASTARDS KNOW IT - AND VOTE AGAINST EVERY INCUMBENT REGARDLESS OF RACE, RELIGION, OR POLITICAL PARTY! ALL OF THEM, REGARDLESS OF OFFICE. If unopposed on the ballot - do not vote that option! Regardless of what you are told, you do not - REPEAT - you do not have to vote anything just because it's on the ballot! Pay no attention to threats that 'your vote won't count' - THAT IS A KNOWING LIE - and that is WHY you must also insist on a PAPER BALLOT rather than an all-electronic. With all-electronic the programming can get ANY result the SOCIALISTS want, and with a PAPER BALLOT the count and re-count and be challenged and re-counted until hell freezes over. You may have to GET RID OF SOME SOCIALISTS to secure new re-counts, but that too is possible to the determined. AND THAT IS THE CURE AND THE PROCESS OF CURE! Now, it's a question of "DO YOU HAVE THE GUTS" to demand the government The Constitution of The United States established, outlines and guarantees? If so, "YOU" are going to have to stand up and be counted against more solidly entrenched KAK JEW SOCIALISTS than you believe even exists. If not, be prepared for the all-but-already-here LEGISLATED ENSLAVEMENT - the already-here never-ending dept crisis - economic depressions at the whim of KAK JEW SOCIALISTS - totally and irrevocable loss of any and all Constitutional Rights and Guarantees, most of which are already legislated and court-precedented into oblivion in disguise of 'crime preventions' by KAK JEW SOCIALISTS!